These are probably some of the best peanut butter cookies out there…at least, that’s what I’ve seemed to glean from the people who ate them. Last Sunday we had small groups at church and of course, I signed up to bring dessert. Lucky for me (and my guests), I was able to try a new peanut butter cookie recipe that my sister recommended, from Ina Garten’s cookbook – Barefoot Contessa Parties! For those you who don’t know, Ina Garten (also known as Barefoot Contessa) is one of my favorite chefs on Food Network. Some of my favorite recipes come from her cookbooks since they are simple, delicious, and slightly fancy. I also like Ina because she seems so motherly & sweet, and reminds me of my aunt Jolene who is kind, caring, generous, and also a wonderful cook. 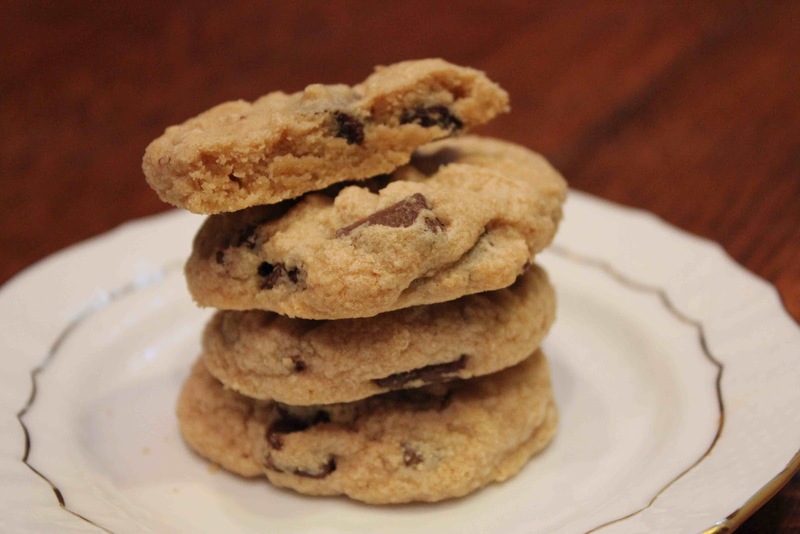 These peanut butter chocolate chunk cookies are Ina’s favorite variation of the old Barefoot Contessa chocolate chunk cookie recipe. They have the combination of flavors in a Reese’s Peanut Buttter Cup…yum! They are moist on the inside while slightly crisp on the outside, and the larger chocolate chunk pieces seem to just melt in your mouth. All my friends at church seemed to love these, especially the guys who were eating anywhere between 3 and 5 cookies. On Monday, I took the remaining cookies to work where my coworkers also raved how delicious they were. The next day upon returning to work, the cookies were gone! Look’s like I’ll be making this recipe sometime in the near future. Enjoy. 2. In the bowl of an electric mixer fitted with the paddle attachment, cream the butter and sugars until light and fluffy. Add the eggs, one a a time. Add the vanilla and peanut butter, and mix. 3. Sift together the flour, baking powder, and salt and add to the batter, mixing only until combined. Fold in the chocolate chunks. 4. Drop the dough on a baking sheet lined with parchment paper, using either a 1 3/4-inch ice cream scoop or a rounded tablespoon. Dampen your hands, flatten the dough lightly, then press the tines of a wet fork in both directions. 5. Bake for exactly 17 minutes (the cookies will seem underdone). Do not over bake. Remove from the oven and let cool slightly on the pan, then transfer to a wire rack and let cool completely. Recipe from: Barefoot Contessa Parties! 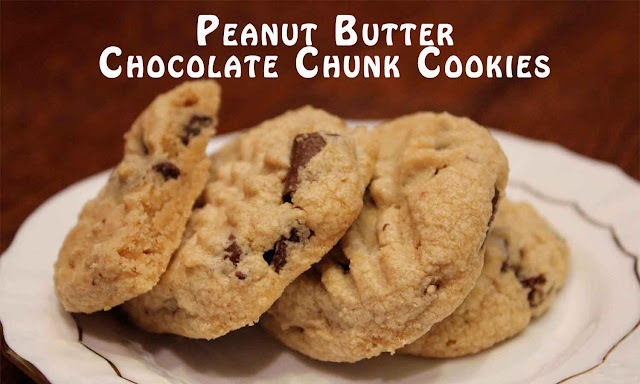 4 Responses to "Peanut Butter Chocolate Chunk Cookies"
Thanks, let me know what you think of them! @contentedsparrow You are so right…definitely 2 sticks of butter not 1. Thanks for the catch!